The village of La Forclaz lies at 1250 meters, beneath the tree border, resulting in beautiful green surroundings. The village has a friendly atmosphere and a local restaurant in which you can have a few drinks during the day. Farmers bring milk to the village every day and have a chat with the local population. At the laiterie you can obtain delicious creamy milk every day. If you bring along the jug from the chalet, these are filled for a franc per liter. Each Thursday there is a market next to the church, where you can buy (and taste) regional products. It is a good place to meet the local population. There is a tennis court in the village which can be used by appointment. From La Forclaz you can make various walks to beautiful places. For example, there is a 1,5 hour walk to the `Lac de Chevonnes’ where you can have a swim or have a drink in the restaurant. You can also reach the lake by car in about 15 minutes. Walking routes are indicated to several places in the area. There are also enough different routes for the more advanced hiker, which lead higher into the mountains, including to some of the peaks. 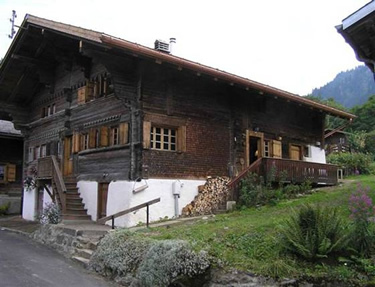 It is possible to return to La Forclaz by train or bus from the surrounding villages. The house remains cool in the summer, which ensures a good nights rest. Behind the house there is a small river where you can find some refreshment. On the terrace there is a large dining table (BBQ in the cellar) and the second terrace has a view over the village and river. The nearest village Le Sepé is located 5 km from La Forclaz and has a small supermarket, bakery and hotel restaurant. Aigle lies in the valley between La Forclaz and Montreux, a small city with a nice centre with good shopping amenities. Large hypermarkets are located just outside Aigle. Montreux is about 30 minutes by car and is situated on the borders of the lake of Geneva. You can take boat excursions on the lake, there is a nice boulevard and there are all kinds of festivities and festivals during the summer. A number of important festivals are organized here annually. The well-known jazz and film festivals are definitely worth a visit. Golf-lovers can go to Villars (18 holes), which is approximately 30 minutes by car. For children there are various theme parks, survival activities and education opportunities.